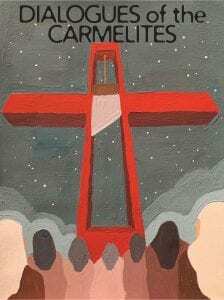 The College of Charleston Opera will present a production of Francis Poulenc’s only full-length opera, “Dialogues of the Carmelites.” It tells a fictional account of the actual events of the Martyrs of Compiègne — the Carmelite nuns who in 1794 refused to renounce their faith during the Reign of Terror of the French Revolution. As a result, they were guillotined in Paris. The performances will take place at 7:00 p.m., with pre-show talk at 6:15 p.m., on Friday, March 1 and Sunday, March 3, at the Recital Hall in the Simons Center for the Arts, 54 Saint Philip St. Tickets are $20 for the general public and $15 for College of Charleston students and 18 and under, available online or at the door (cash and check only). This cast will feature College of Charleston students, a reduced orchestra that is comprised of both professionals and College of Charleston students, with faculty member Rob Taylor at the helm. Watch an interview clip with Director DeAthos-Meers on Lowcountry Live. The College of Charleston Opera is a program in the Department of Music in the College’s School of the Arts.